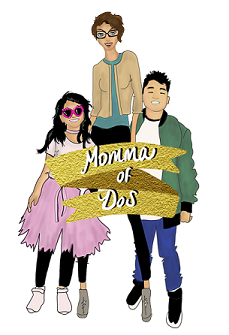 Momma of Dos: How do you do?! The question is; How do you do? How will you manage with 2 kids? How will you manage with 3 or 4? Two weekends ago one of Ricardo's uncles came to our home. With 2 of his 4 daughters and his one son. Yes he has 5 children. I asked him. How do you guys do it with 5 kids? He said "The same that you did with one and now DOS." I thought. So simple. Yet SO true. I used to think Santiago was enough or as much as I could humanly handle. Now, I have TWO? Granted Camila is only 3 1/2 weeks but she can be a handful as well, not as much as I anticipate she will be in a couple of months but still. I have managed for 3 1/2 weeks to make it. To get it all done and remain calm. Now, by NO means does this mean that you will come to a completely clean house and see fully groomed children or a Mom who is showered and ready for company. But, I manage. I overcome and move on! My family, I have stated several times is not perfect! We try our best to be at our best. That's what God wants from us. We are human. We will fail. We will have bad days. But amidst all those things...we are Blessed. We have one another. We love one another. We support one another. We are here. We share smiles and laughs. Hugs and kisses..... AND THAT, IS HOW WE DO! I love this new journey of my life. Filled with adventures and everyday mystery! Isn't that what we all seek in life to have fun filled days, expecting the unexpected! This moderate thrill seeker has definitely been satisfied with all that life has given her. I hope and pray that people don't see my post as negative or joy-less, because trust me..I am the happiest person you will meet despite tragedy and bad news... I make the best of every situation and above all LOVE. Life has been good to my Husband and I. No matter how much we could possibly complain, we try not to, but if we did, we couldn't complain as much as we could Thank God for all the GREAT-ness He has given us! We are AFTER ALL....TEAM GOMEZ!! !